When in the late 50s the US developed the B-58 Hustler supersonic strategic bomber followed a little bit later by the even faster and high-altitude XB-70 Valkyrie strategic bomber and the SR-71 Blackbird recon plane, the Soviet aerospace industry was faced with a problem of urgent development of an effective aircraft to counter them. The Mikoyan design bureau had already been experienced in developing and testing a series of prototype and experimental supersonic interceptors that had been developed under the Uragan intercept programme (I-3U, I-7U, I-75, E-150) and fitted with powerful radars and missiles. The latest aircraft of that series (E-150 and E-152) were the first Soviet planes able to fly at a speed of 3,000 km/h and at a service ceiling of 22-23 km. Such speed and altitude were enough for a prospective interceptor. However, to effectively counter such worthy opponents as the B-58, XB-70 and SR-71, it had to have a greater intercept range, a longer range radar and all-aspect long-range air-to-air missiles. Mikoyan took up developing such an aircraft (the design bureau's designation E-155) in 1961. In designing it, the experience derived from development of the E-150 and E-152 was leaned on. First of all, this was true for the use of materials capable of withstanding high temperature at a supersonic speed as well as the use of the R15-300 low-pressure turbojet engine and intercept automation during the ground command post-controlled cueing in on the target. Alongside the E-155P interceptor, another two versions were considered - the E-155R high-altitude recon plane to be able to carry several variants of the recon suite and an aircraft capable of carrying an aeroballistic missile. As far as the design was concerned, all three versions were expected to be unified to the maximum extent and to differ only in avionics and weapons. The Mikoyan bureau's design was approved by the Defence Ministry leaders, which prompted on 5 February, 1962 the Decree of the Communist Party Central Committee and the USSR Council of Ministers on development of the E-155P interceptor and deriving from it the E-155R high-altitude reconnaissance aircraft. The mock-up commission took place the same year. The E-155R's appearance differed radically from any of the then current planes: it was to be fitted with a flat side-mounted horizontal ramp air intake, twin tails and thin trapezoid low aspect ratio wing. A heavy take-off weight (over 35 tonnes) and unique speed (3,000 km/h) and ceiling (22-23 km) determined the choice of the powerplant that was made up of two R15B-300 afterburner turbojets, each developing 11,200 kgf in afterburner. The engines were mounted side by side in the tail section of the airframe. The choice of the materials was also dependent on the performances - up to 80% of the plane was made up of VNS-2, VNS-4 and VNS-5 stainless steel, about 8% was titanium alloy with around 11% being ATCH-1 and D-19T heat-proof aluminium alloys. The main technological method employed for the airframe production was semiautomatic welding. The E-155P was expected to serve as the mainstay of the S-155 aircraft/missile intercept complex which, beside the plane proper, consisted of the Smerch-A radar, K-40 semiactive radar and IR homing missiles and Vozdukh-1 ground-based guidance system. In 1962-63, Mikoyan's experimental production facilities commenced the assembly of four E-155 prototypes - two interceptor version planes (E-155P1 and E-155P2) and two recon version ones (E-155R1 and E-155R2). The E-155P1 was completed in the summer of 1964 with the prototype being shipped to the Zhukovsky-based Flight Testing Facility on 12 August, 1964. On 9 September, 1964, test pilot P.M. Ostapenko took the aircraft into the air for its maiden flight. A year later, the other interceptor prototype arrived to the FTF and made its maiden-flight on 16 September, 1964. To expedite the testing, productionising of the E-155P was commenced at the Gorky-based 21st Plant (nowadays: the Nizhny Novgorod-based Sokol aircraft production plant). As early as in 1966, the first two Gorky-made interceptors - E-155P3 and E-155P4 - joined the official testing that had been underway since December 1965. Unlike the E-155P1 and E-155P2, they featured four hardpoints for mounting missiles (the first two planes could carry only two K-40 missiles each) and a full set of the Smerch-A radar system. To perfect the Smerch-A radar and K-40 missiles, the LM-104 flying lab derived from the Tu-104A aircraft (reg. #42326) was used too. In the summer of 1967, the Gorky plant made the fifth prototype interceptor - the E-155P5 (which was the E-155's eighth flying prototype, considering the three recon prototypes under construction in parallel then). To enhance the plane's directional stability, its wingtips were fitted with additional vertical control surfaces which were integrated with spars with the latter serving as a flutter-preventive weights. Four interceptor prototypes participated in the 9 July, 1967 air parade at the Domodedovo airfield. They were flown by the Air Force Scientific/Research Institute military test pilots who had been conducting the official flight testing - I.I. Lesnikov (E-155P1), G.A. Gorovoy (E-155P2), V.I. Petrov (E-155P3) and G.B. Vakhmistrov (E-155P5). The advanced interceptors caused quite a stir among the spectators. On 5 October, 1967, test pilot A.V. Fedotov made a world altitude record for one and two-tonne loads (29,977 m), thus beating the American record by 4,000 m.
In 1966, Mikoyan added a series of substantial modifications to the E-155P3, E-155P4 and E-155P5's design as well as to that of the E-155R3 recon plane. The technical documentation for those modifications was handed over to the Gorky-based plant, at which the ninth flying prototype - E-155P6 - was built in 1967. The modifications included alteration of the cockpit, elongation of the airframe fore section, installation of independent turbostarter start-up engines featuring AC generator drives, modified air intake control system, increased area tails, reinforced wings, new wingtips with regular flutter-preventive weights, all-terrain undercarriage and newer landing gear wells and some newer avionics. In 1967, the Gorky plant made first series-built interceptors designated E-155P7, -P8 and -P9 with the E-155P10 and -P11 following in 1968. The standard for series production was the E-155P6. All the above aircraft took part in the S-155 interceptor complex's joint official testing that was initiated in December 1965. The first phase of the testing was complete in November 1968 resulting in the preliminary approval for the commencement of series production. 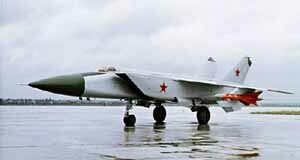 In line with that approval, the interceptor complex was officially designated MiG-25P. Also in November 1968, Phase B of the joint official testing began to be successfully completed in May-1970. Not long before that, first series-built MiG-25Ps were fielded with the Air Defence Forces Aviation Training Centre based in the town of Savasleyka with the ADF air regiments commencing transition to the new aircraft later in 1970. 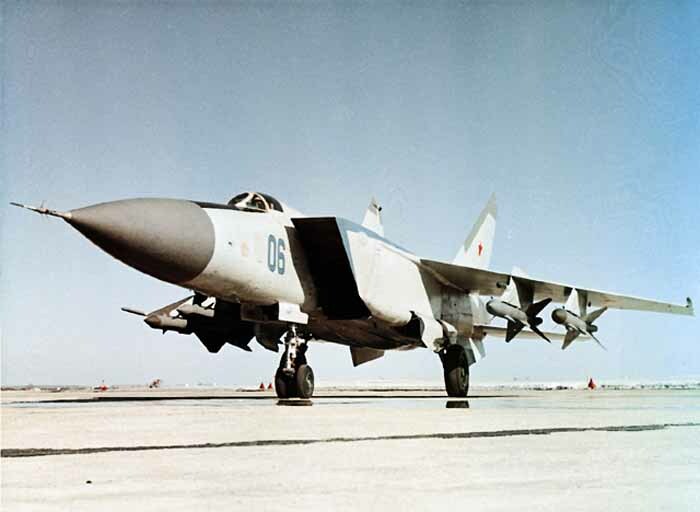 The USSR Council of Ministers' resolution of 13 April, 1972 authorised the inclusion into the inventory of the MiG-25 interceptor as part of the MiG-25-40 (S-155) interceptor complex. The MiG-25-40 (S-155) aircraft/missile interceptor complex comprised the MiG-25 aircraft equipped with the Smerch-A radar and Polyot-1I navigation suite and armed with four R-40 medium-range radar (R-40R) and IR (R-40T) homing air-to-air missiles. It also featured the Lazur-M set as part of the Vozdukh-1 ground command guidance system. The MiG-25's official testing and subsequent operation evoked a series of further modification to their design. Some of these modifications resulted from several grave in-flight incidents suffered by prototypes and early series-made aircraft. Thus, on 30 October, 1967, the E-155P1 flown by military test pilot I.I.Lesnikov crashed during an attempt to set a new rate of climb record due to the aileron reversal caused by the exceeding of the instrument speed limit. Resulting from the crash, a measure was taken to provide satisfactory lateral control at any speed: the horizontal stabiliser's halves were altered to provide differential deflection to control banking, which led to an increase in max instrument speed from 1,000 km/h to 1,200 km/h. On 26 April, 1969, the E-155P11 flown by General A. Kadomtsev, ADF Aviation Commander-in-Chief, crashed during a familiarisation sortie due to separation of a R-15B-300 engine rotor blade, which caused physical damage and fire. Following General Kadomtsev's death, the engine was redesigned and the temperature of gas before the turbine was temporarily reduced. 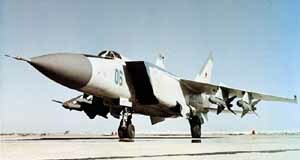 A few crashes took place in the early 1970s after the MiG-25P entered the Air Force's inventory. On 31 May, 1973, a MiG-25P (reg.  #808) piloted by Air Force Scientific/Research Institute's test pilot A.V. Kuznetsov crashed in Akhtubinsk. 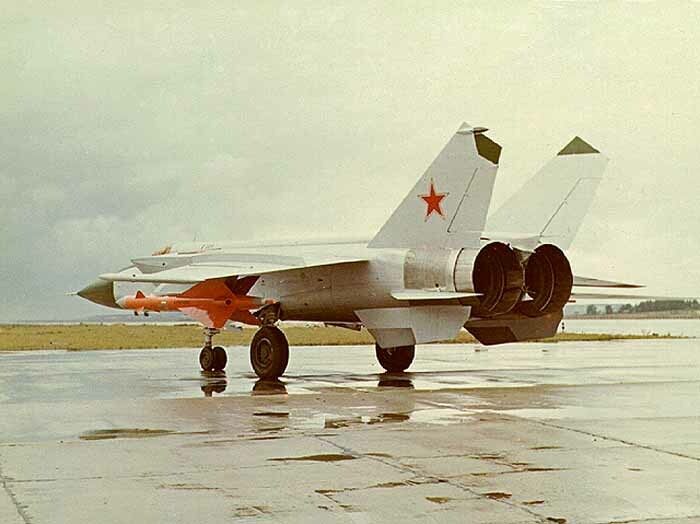 It was the first MiG-25P featuring the differential horizontal stabiliser. The same thing happened to military pilot Maystrenko in the Kubinka AFB and Flight Test Institute's test pilot O.V.Gudkov in the Zhukovsky-based Flight Testing Institute (4 October, 1973). The reason for all three crashes was the same - the stabiliser's overcompensation: in certain flight modes the actuators lacked sufficient power to manage the horizontal stabiliser. To deal with the snag, the stabiliser's axis of rotation was moved 140 mm forward, which made the aircraft easy and reliable to control at all speeds and altitudes. Some modifications were introduced into the interceptor's avionics suite too. 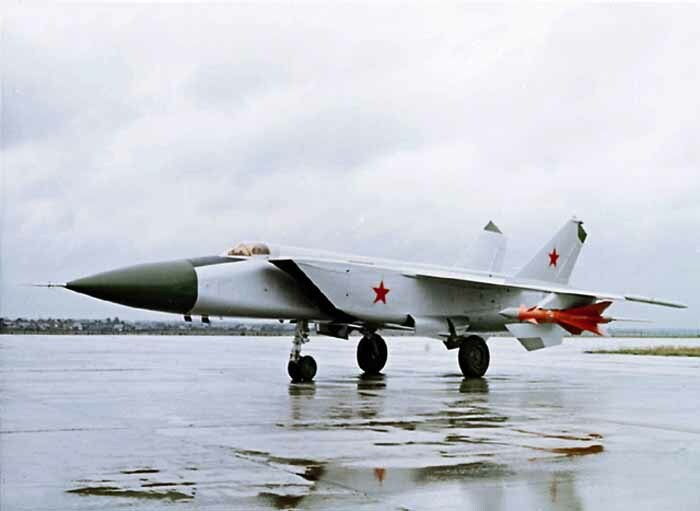 Thus, during the MiG-25P production, the Smerch-A radar was replaced with the more reliable Smerch-A2 radar with the instrument guidance, automatic control and communications systems being upgraded too. In 1974, the upgraded Smerch-A3 radar was presented for testing. It featured the spatial target selection mode providing detection capability against ground clutter. 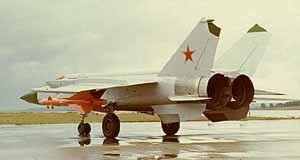 However, the method was considered ineffective, which led to employing a different radar type to enhance the interceptor's low-altitude target capability ( MiG-25PD). The MiG-25P had been series-produced by the Gorky-based plant from 1968 until 1982 with a little over 460 aircraft being built.